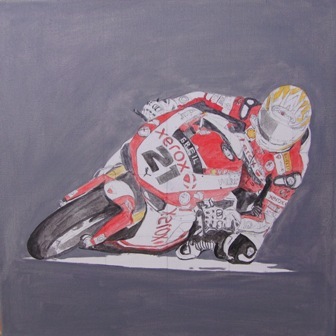 Another little update … the background is finished, and I have the right shade of red for the bike. Still plenty to do, mainly with the lettering and shadows. The next update will be with this painting finished. My husband & I are fans of motorbike racing, whether it be MotoGP or World Superbikes. In 2007 & 2008, we were fortunate enough to ‘bump into’ 3 time World Superbike Champion, Troy Bayliss, in the paddock at Ricardo Tormo Circuit, Cheste, Spain. 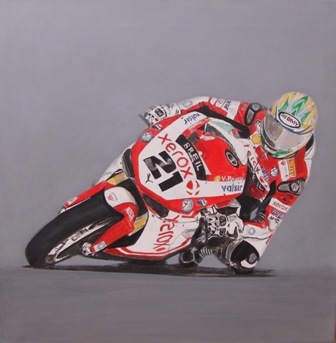 With the other motorbike paintings on the wall of our dining area, my hubby has been ‘nagging’ me for over a year to paint his favourite champion to add to the collection! Finally I have finished drawing it out in the left picture. 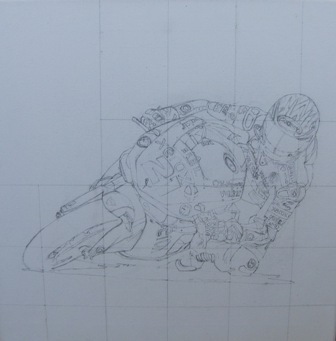 I can see that the petrol cap and the front mud guard are not quite right – I drew directly onto the canvas and couldn’t erase it very well, however this can be changed later. So now for the fun bit … painting it. The middle picture has it’s first coat of paint. It was such a relief to finally put paint to canvas, and to see the painting slowly coming together. 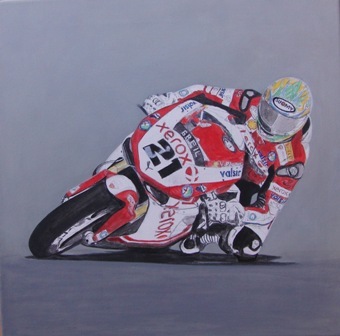 At the moment the background is too dark and so the next stage is to get that the right colour and then I can concentrate on the bike detail. The background is almost correct in the right picture and I’m now starting to the block in the colour and get into the detailing.